So many destinations, so little time! New Zealand, Aotearoa or the Land of the Long White Cloud has another, not so common nickname – the Shaky Isles. Last month (August 2013) Seddon, a town on the tip of the South Island, across the Cook Straight from Wellington, was shaken by a 6.6 magnitude earthquake with aftershocks that went on into the evening. New Zealand lies on the Pacific ‘Ring of Fire’, which is an area where a large number of earthquakes and volcanic eruptions occur and is home to over 75% of the world’s active and dormant volcanoes. According to Wikipedia, about 20,000 earthquakes are recorded in New Zealand each year (most of them minor), with only about 200 being large enough to be felt. Volcanoes are also abundant, with Auckland being built on a volcanic field that contains approximately 53 (mostly dormant) volcanoes! Driving around exploring the country, it’s common to see areas where landslides have occurred and when you start looking at the surroundings it’s very easy to see how quickly they could happen. After visiting Goat Island Marine Reserve recently, it literally took us 10 minutes to drive from sea level to the top of the high surrounding ridge. The steep, winding roads have sharp bends with deep gulleys on one side and precarious-looking grassy banks and boulders looming above on the other. If the soil is a bit unstable, simply too much rain or an earthquake nearby could cause it all to come gushing down! With all the rain that New Zealand gets, the natural bush is beautifully lush and green, reminding us of a combination between Hillcrest, Nottingham Road and Jurassic Park. There’s no real separation here between residential, farmland and commercial property. You’ll be driving along and there’ll be a little town, suddenly there’s farmland and a little further on maybe a shopping centre or another residential area, before another sudden patch of farmland! Let me explain a little further for those who don’t quite get the reference to the three areas mentioned above. Hillcrest because of all the natural bush, dense trees and cool damp air; Nottingham Road (in the Kwa-Zulu Natal Midlands) because of the open fields, farmlands, winding roads and ‘country feel’. You may understand the references to Hillcrest and Nottingham Road, but Jurassic Park? That’s about dinosaurs right? … Well, NZ’s natural bush has a different kind of look to it. 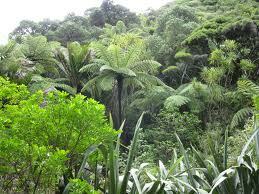 With many tall tree ferns in amongst the forest, there are certain areas that feel very ‘Jurassic Park’. You almost expect a dinosaur to pop its head out the foliage as you drive or walk slowly by. Maybe this picture will give you some idea of what I’m talking about. 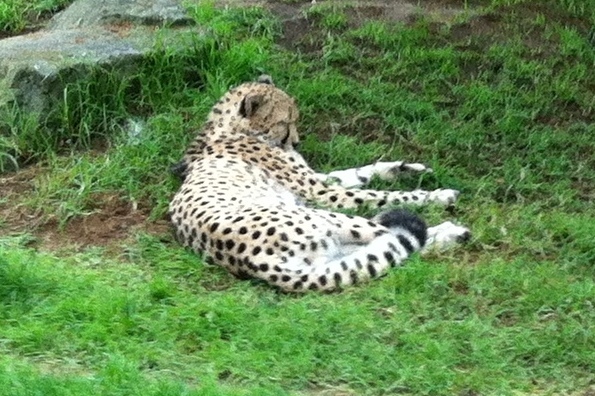 Kiwi’s, Wallabies, Lions and Tigers! 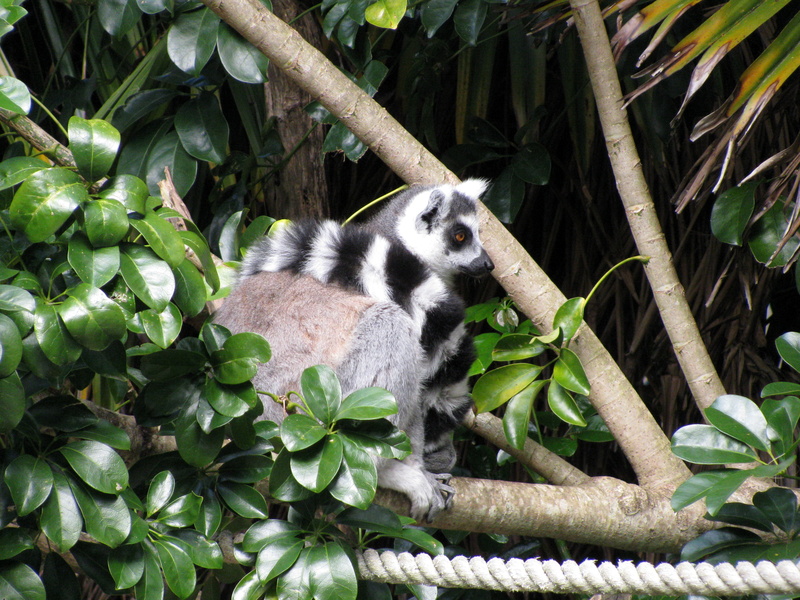 When visiting Auckland Zoo, don’t forget your camera and make sure your batteries are charged, as there are loads of great photo opportunities here. 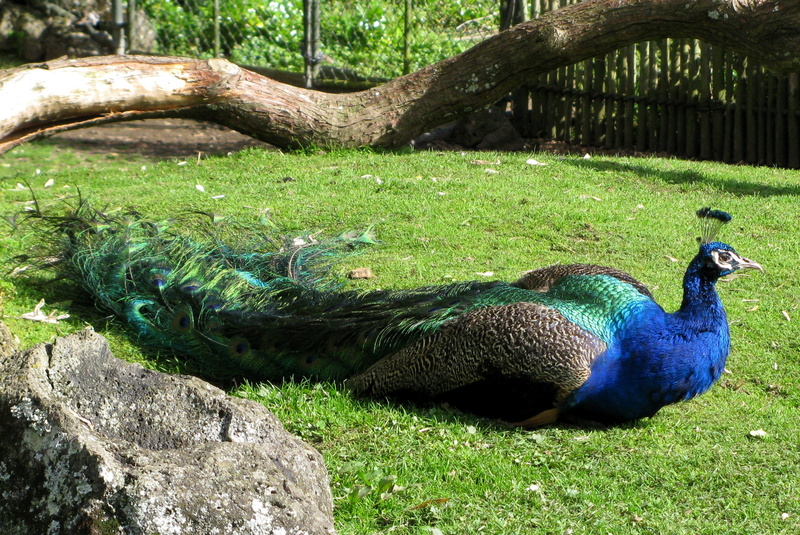 The zoo has frequent “animal encounters” (zookeeper talks) at various animal enclosures, where you get to see the animals perform various tasks while the zookeeper tells you interesting facts and other information about the animals. I just love otters and it was wonderful to watch these sleek, elegant, playful creatures up close while they rough-and-tumbled and sunned themselves. The zoo has two groups of otters, Juno and Jeta were the first ones we saw, as they live in the enclosure next to the “Tiger Territory”, as you enter the zoo. 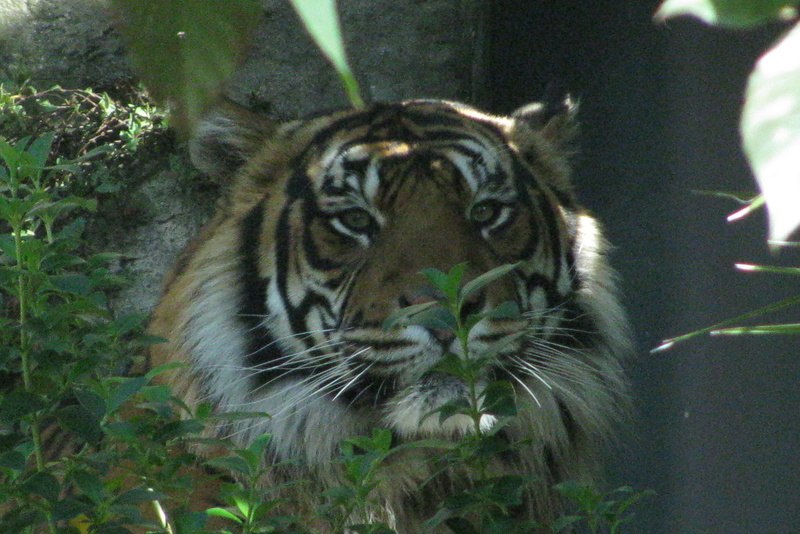 “Tiger Territory” was up next and is home to three Sumatran tigers. A male (Oz), a female (Molek) and one of their offspring (Berani). One of these tigers was busy pacing up and down in the enclosure … I’m not sure if it was in anticipation for the up-coming Animal Encounter or whether it was near snack time, but s/he did stop long enough for a quick snap-shot through the foliage. 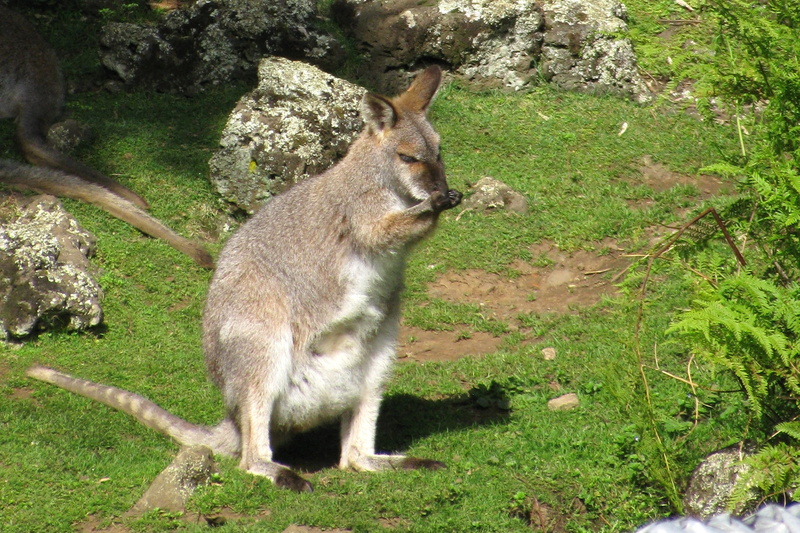 The “Aussie Walkabout” is an open-plan area (secured with double gates and fences) that is home to two species of wallaby and the flightless emu which is the second-largest bird in the world. The walk through this enclosure gives a little taste of the Aussie wildlife and we also got to see the common peafowl (also known as peacock), but I’m not sure if he lives in this enclosure or if he just flew in for a visit. We got to see numerous bird species: parakeet & lorikeet, conures, parrots, macaws, teal, pigeons, doves (including one with a “bleeding heart”), cockatoo, lovebirds, cheeky Kea and believe it or not, they even have chickens! The chimpanzee enclosure was hidden between the “Aussie Walkabout” and some of the bird enclosures and we managed to see Janie, an over 50-year old chimp, figuring out how to get her snacks out of sealed containers by opening the lids on tupperware containers to access her “prize” or by using a stick or her fingers to scoop the food out of a narrow hole in tubular containers. It was quite amazing to watch her exercising her mind. “Pridelands” has a very African grasslands feel to it and is inhabited by zebra, ostriches (the largest, flightless bird in the world) and giraffes. An Asian Elephant wandered around and white rhino and pronking sprinkbok could also been seen, while the lions have their own enclosure, for obvious reasons! We got to see a playful lioness stalking an oblivious duck in her enclosure (the lioness lost interest after a while and the duck got away unharmed). Meanwhile, the cheetah brothers, Anubis and Osiris, were chilling out in the shade when we reached their enclosure and hardly even gave the visitors any notice. “The Night” is home to various nocturnal animals, like the little Kiwi bird, Morepork (a little owl), New Zealand lesser short-tailed bat, Kauri snail and Archey’s frog. Just like it’s name suggests, this enclosure is completely dark and it takes your eyes a few minutes to adjust to the darkness. Flash photography is prohibited in “The Night”, but you are allowed to photograph the other animals in other areas of the zoo. Some of the other interesting areas to visit are “The Rainforest”, “Discovery and Learning Centre”, “The High Country”, “The Forest”, “The Wetlands” and “KidZone”. 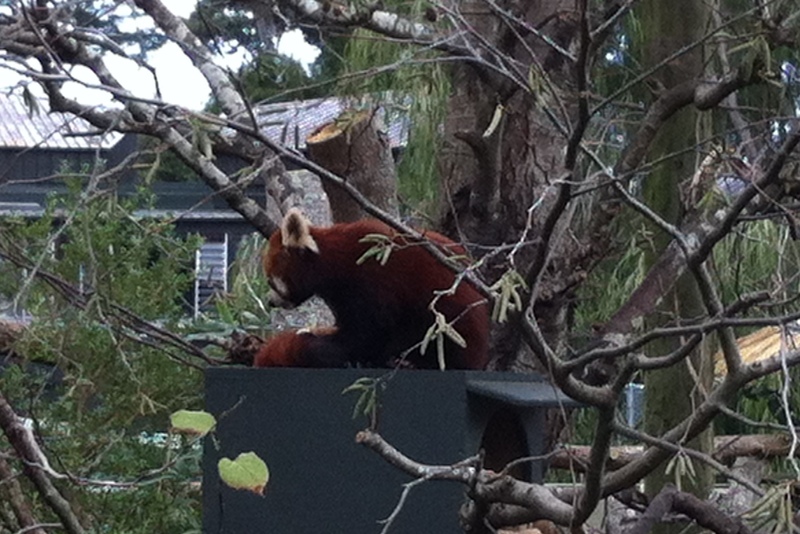 Last but not least, we came across the second Red Panda enclosure and finally got to see a shy Red Panda. This cute little creature looks like a cross between a bear, cat and raccoon and it looked like s/he only came out for a quick snack. Obviously not a big fan of crowds, but oh so cute! 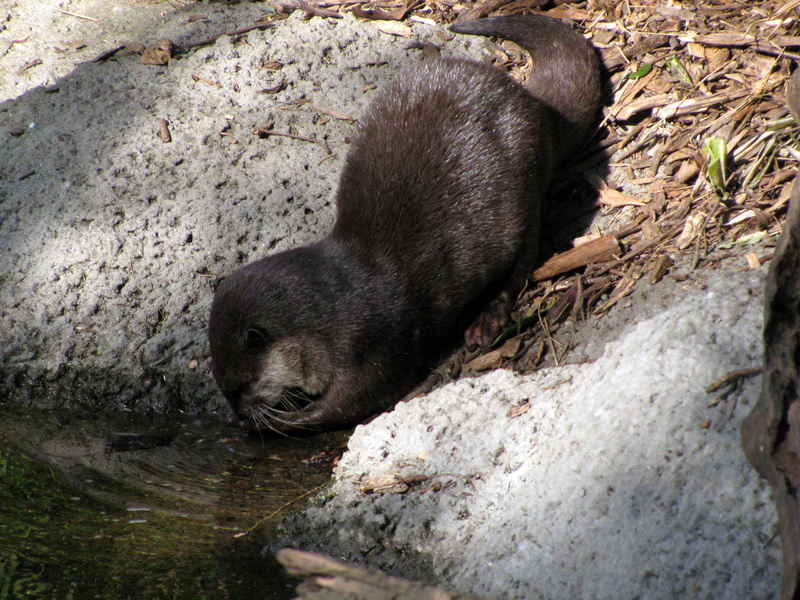 Auckland Zoo is also home to some weird and wonderful creatures like the Azolotl (a Mexican walking fish), Scheltopusik (a legless lizard) and Snake-necked turtles to mention a few. With so much to see and do, a full day is needed to really explore, see and appreciate these wonderful animals. So grab your camera, pack your lunch and head out for a wonderful day at the zoo!